Excellent sound is the quality Clarett owners love most. With up to 119dB of dynamic range, superbly low noise, precision 24/192 conversion and four specially-designed mic preamps with a unique analogue “Air” effect, Clarett 4Pre simply sounds great, easily out-performing other interfaces in its class and beyond. Meanwhile, its astonishing 1.67ms round-trip latency* simplifies your workflow and lets you use your favourite plug-ins in real time. The mic pres have been designed especially for the Clarett range, with plenty of gain, yet low noise and distortion. In addition, they include a special “Air” feature that switches in an analogue model of the classic transformer-based Focusrite ISA mic pre. The Instrument inputs also feature extra headroom to handle the loudest pickup. Clarett features Focusrite’s class-leading 24/192 conversion: with up to 119dB dynamic range, Clarett offers the cleanest way yet to get music in and out of your DAW. 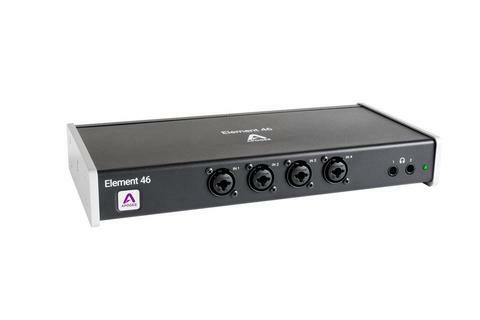 All four mic/line inputs are on the front panel for instant, easy access, and Clarett 4Pre’s compact, rugged form factor makes it ideal for use on the road as well as in the studio. Clarett’s ultra-low round-trip latency completely transforms your workflow. If you’re used to having to build two different mixes – one using input monitoring to overdub, the other using the DAW for playback – the good news is that now, one is enough. Build your mix on the DAW and use it whether you’re overdubbing (monitoring the input you’re recording with the new Focusrite Control software mixer) or playing back, with all your plugins in place, all the time. 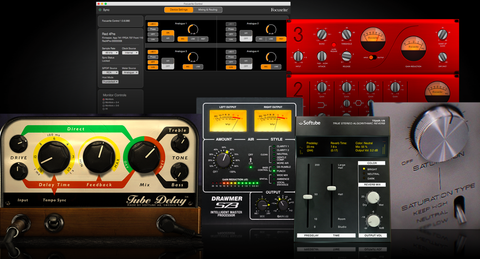 Use your favourite plugins while recording too – whether it’s reverb on a vocal, a guitar amp simulator, or even virtual instruments live on stage. 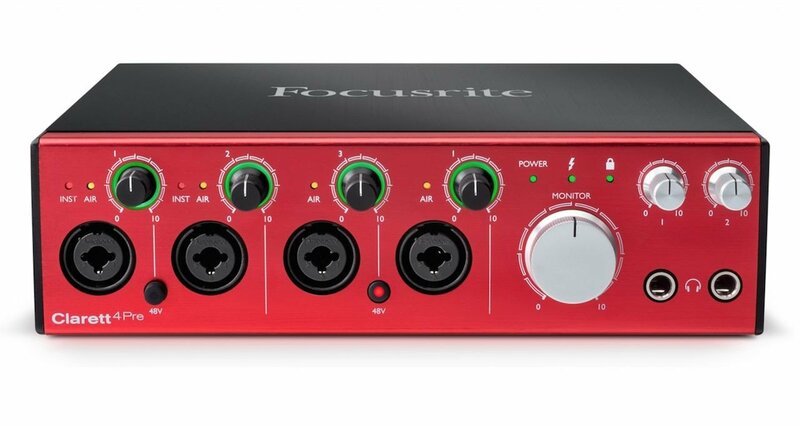 Each of the four front panel inputs includes Focusrite’s signature “Gain Halo” – an illuminated ring around the gain control that lights up green when there’s signal and red when it’s too high. There’s a main monitor knob plus dual high-power headphone outputs with their own volume controls. Clarett 4Pre offers a full 18 audio inputs and eight outputs, including four front-panel multi-function inputs, four independent line inputs and line outputs, stereo S/PDIF I/O and dual headphone outputs. There are also eight channels of ADAT-format digital input – ideal for adding eight channels of digital mic pre.